iperceptions is a tool that make it easy for businesses to collect client feedback and measure them to assess customer satisfaction. As more and more companies become increasingly reliant on their websites to generate more revenue, it is imperative that management become more aware of what their customers really feel about their products and services in real time. 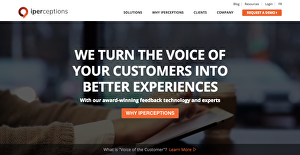 iperceptions does this via its popular VOC (Voice of Customer) survey feature, which can be embedded on the company’s homepage, allowing clients and potential customers to directly send their thoughts, comments, and reactions straight to the management. The system also provides specific and targeted surveys for a particular aspect of their business. Running multiple surveys with varying objectives simultaneously is also something iperceptions provide its users. iperceptions is a highly trusted customer feedback platform that helps businesses increase their sales using a three-pronged approach. You can gather high-value customer feedback and actionable insights that can be instrumental for business objectives. It allows you to bolster ROI to a company-wide level by sharing business intelligence to marketing and sales teams. You can provide better customer experiences, retain loyal customers, and improve conversion by tailoring products and services to meet desires and expectations. Every company has different needs and needs an application that can be personalized for their size, kind of staff members and customers, and the particular industry they are in. For these reasons, no software can provide perfect tools out-of-the-box. When you look for a software product, first be sure what you need it for. Read some iperceptions reviews and ask yourself do you want basic functionality or do you want advanced functionality? Are there any industry-specific tools that you are looking for? Find the answers to these questions to aid your search. There are multiple factors that you need to reflect on and these include your finances, particular business wants, your company size, integration requirements etc. Take your time, try out a few free trials, and finally choose the platform that offers all that you require to boost your company efficiency and productivity. How Much Does iperceptions Cost? iperceptions’ enterprise pricing information is available only upon request. Contact the vendor for more details, and ask for your quote. We realize that when you make a decision to buy Customer Support Software it’s important not only to see how experts evaluate it in their reviews, but also to find out if the real people and companies that buy it are actually satisfied with the product. That’s why we’ve created our behavior-based Customer Satisfaction Algorithm™ that gathers customer reviews, comments and iperceptions reviews across a wide range of social media sites. The data is then presented in an easy to digest form showing how many people had positive and negative experience with iperceptions. With that information at hand you should be equipped to make an informed buying decision that you won’t regret. What are iperceptions pricing details? What integrations are available for iperceptions? If you need more information about iperceptions or you simply have a question let us know what you need and we’ll forward your request directly to the vendor.